Pierre Claeyssens was born in Antwerp, Belgium, on December 16, 1908. By the time he was eight years old, he faced the devastation that WWI and the German occupation of Belgium brought. As a result of the war efforts, much of the country had been destroyed and food was scarce. Pierre’s day-to-day life was a constant battle to survive, living off as little food as possible. Pierre would state that he was lucky, despite the hardships, because he only fainted from hunger once, whereas many of the Belgian children – including his friends – died. Pierre credited much of his survival to the Hoover Relief program, which brought food to the children at Belgian schools. This, he said, is what saved his life, and he never forgot the impact the Hoover Relief had for children and adults alike in occupied Belgium: he became eternally grateful to the United States and its spirit of philanthropy. After high school Pierre entered an all-boys college in 1927 to study architecture. After obtaining his college degree, Pierre served his two years of mandatory military service (1930-1932) and by 1934 he was working as an architect in Antwerp. However, the Great Depression was in the process of wrecking havoc on Europe at this time, and the effects were disastrous: standards of living dropped severely, job opportunities were rare, and a great deal of human suffering occurred as a result. Pierre could see no potential future as an architect in Belgium, so he decided to make drastic changes. In 1936 Pierre’s sister had left for the US with her two aunts, and moved to Chicago. By 1938, Pierre decided to join his sister – who acted as his sponsor – and he emigrated from Belgium to the United States to find work. In Pierre’s eyes, America – a powerful country located thousands of miles away from war-torn Europe – offered security and opportunity to anyone willing to work. Though he spoke Flemish, French, and Dutch fluently, and also understood some German, Italian, and a little Russian, Pierre had no fluency in the English language. He soon found employment, and started working two jobs, all the while attending night school with other immigrants learning English. When America entered WWII, Pierre was too old to be drafted or serve as an enlisted man, so he went to work in Laguna Beach where he found a job designing Liberty ships and other naval vessels. This was his job for the entire war. When the war finally ended, Pierre was able to resume his profession, working as an architect under Frank Lloyd Wright Jr.
Pierre went on to marry Fay Hannam Byatt in 1946. An immigrant from South Africa, Fay had arrived in the United States in 1934. Fay’s father died when she was just eight years old, and her mother Hilda struggled to raise twin girls on her own without her husband. As the girls grew older, she wanted them to live in a country where two young women would have opportunity and security. As a married couple, Pierre and Fay gave birth to two children in 1950 and 1951. However, their married years were cut short when Fay passed away from cancer in 1963. Unfortunately for Pierre - though he married three times in his life - he outlived each and every one of his wives. During the course of his life, Pierre travelled extensively and visited countless other countries. Though he loved being able to see the world, on his return he would always say that “there is nowhere in the world like the United States,” and that he would never live anywhere else. Ailene Barnes was born in Santa Barbara, CA on January 27, ¬1906. Ailene had a long history of family ties to Santa Barbara, and was related to attorney Francis Price and Dwight Murphy, part owner of the San Marcos Ranch. After attending university and earning a degree in English, she began working as a business secretary, eventually working for Emma Wood (of Taylor Ranch). It is through this association that she came to know Buddy Wood, Emma’s husband. However, it was not until 1948 (4 years after Emma’s sudden death) that she and Buddy would develop a relationship and marry. The couple and their daughter Cynthia (Ailene’s daughter from a previous marriage, born 1937, whom Buddy formally adopted) lived together in a home on Casitas Pass road. In addition to maintaining their businesses and properties, the two were generous philanthropists and made many charitable donations to the local community. 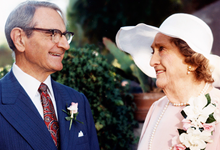 In the 1950s and 1960s, Ailene and Buddy endowed Wood Glen Hall, established a scholarship for medical students through the Santa Barbara Foundation, and gave anonymously to multiple other organizations and causes. In 1971 - After 23 years of marriage - Buddy Wood died in Santa Barbara at the age of 89 and Ailene was left a widow. However, two years later Ailene found love again and married Pierre Claeyssens in Santa Barbara on June 25, 1973. Pierre and Ailene shared a love of travel, and a love of philanthropy. By 1980, Pierre and Ailene founded the Wood-Claeyssens Foundation as a way of giving back to the community and sharing the wealth that they both felt so fortunate to have. (Both Pierre and Ailene had experienced severe poverty during their childhoods and the Great Depression, and – as such – both understood what it was like to be poor and in need). Ailene was known to have said, “You can only eat so much, drink so much, and wear so much…”, meaning that it was only natural for her to want to use her extra funds to improve the lives of others in the community. Ailene and Pierre never believed in pretentiousness, and (Ailene especially) closely guarded their privacy. She was a very astute woman, and had great business sense, managing multiple businesses and properties well into her 80s. The two shared many wonderful years together, which only came to an end on June 01, 1995, when Ailene died at the age of 89.